Corresponding author: Patrice Bouchard (patrice.bouchard@agr.gc.ca). (C) 2010 Patrice Bouchard. This is an open access article distributed under the terms of the Creative Commons Attribution License, which permits unrestricted use, distribution, and reproduction in any medium, provided the original author and source are credited. We synthesize data on all known extant and fossil Coleoptera family-group names for the first time. A catalogue of 4887 family-group names (124 fossil, 4763 extant) based on 4707 distinct genera in Coleoptera is given. A total of 4492 names are available, 183 of which are permanently invalid because they are based on a preoccupied or a suppressed type genus. Names are listed in a classification framework. We recognize as valid 24 superfamilies, 211 families, 541 subfamilies, 1663 tribes and 740 subtribes. For each name, the original spelling, author, year of publication, page number, correct stem and type genus are included. The original spelling and availability of each name were checked from primary literature. A list of necessary changes due to Priority and Homonymy problems, and actions taken, is given. 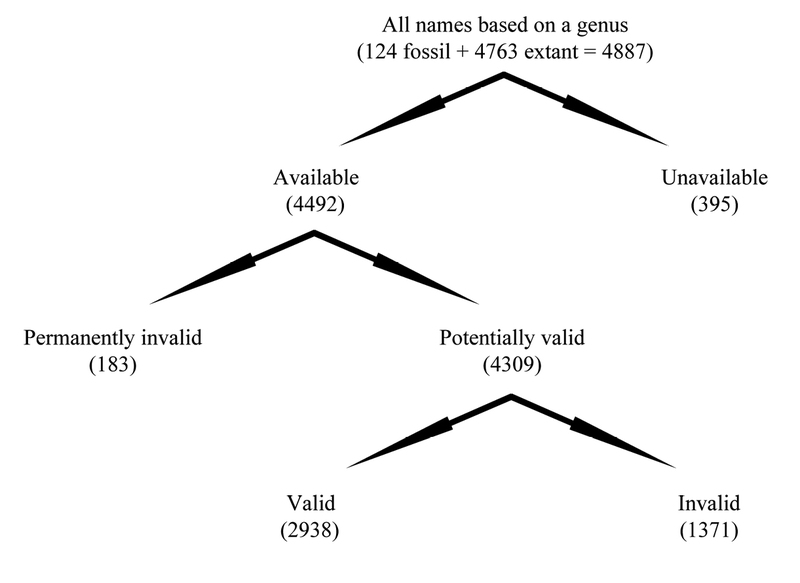 Current usage of names was conserved, whenever possible, to promote stability of the classification. New synonymies (family-group names followed by genus-group names): Agronomina Gistel, 1848 syn. nov. of Amarina Zimmermann, 1832 (Carabidae), Hylepnigalioini Gistel, 1856 syn. nov. of Melandryini Leach, 1815 (Melandryidae), Polycystophoridae Gistel, 1856 syn. nov. of Malachiinae Fleming, 1821 (Melyridae), Sclerasteinae Gistel, 1856 syn. nov. of Ptilininae Shuckard, 1839 (Ptinidae), Phloeonomini Ádám, 2001 syn. nov. of Omaliini MacLeay, 1825 (Staphylinidae), Sepedophilini Ádám, 2001 syn. nov. of Tachyporini MacLeay, 1825 (Staphylinidae), Phibalini Gistel, 1856 syn. nov. of Cteniopodini Solier, 1835 (Tenebrionidae); Agronoma Gistel 1848 (type species Carabus familiaris Duftschmid, 1812, designated herein) syn. nov. of Amara Bonelli, 1810 (Carabidae), Hylepnigalio Gistel, 1856 (type species Chrysomela caraboides Linnaeus, 1760, by monotypy) syn. nov. of Melandrya Fabricius, 1801 (Melandryidae), Polycystophorus Gistel, 1856 (type species Cantharis aeneus Linnaeus, 1758, designated herein) syn. nov. of Malachius Fabricius, 1775 (Melyridae), Sclerastes Gistel, 1856 (type species Ptilinus costatus Gyllenhal, 1827, designated herein) syn. nov. of Ptilinus Geoffroy, 1762 (Ptinidae), Paniscus Gistel, 1848 (type species Scarabaeus fasciatus Linnaeus, 1758, designated herein) syn. nov. of Trichius Fabricius, 1775 (Scarabaeidae), Phibalus Gistel, 1856 (type species Chrysomela pubescens Linnaeus, 1758, by monotypy) syn. nov. of Omophlus Dejean, 1834 (Tenebrionidae). The following new replacement name is proposed: Gompeliina Bouchard, 2011 nom. nov. for Olotelina Báguena Corella, 1948 (Aderidae). Reversal of Precedence (Article 23.9) is used to conserve usage of the following names (family-group names followed by genus-group names): Perigonini Horn, 1881 nom. protectum over Trechicini Bates, 1873 nom. oblitum (Carabidae), Anisodactylina Lacordaire, 1854 nom. protectum over Eurytrichina LeConte, 1848 nom. oblitum (Carabidae), Smicronychini Seidlitz, 1891 nom. protectum over Desmorini LeConte, 1876 nom. oblitum (Curculionidae), Bagoinae Thomson, 1859 nom. protectum over Lyprinae Gistel 1848 nom. oblitum (Curculionidae), Aterpina Lacordaire, 1863 nom. protectum over Heliomenina Gistel, 1848 nom. oblitum (Curculionidae), Naupactini Gistel, 1848 nom. protectum over Iphiini Schönherr, 1823 nom. oblitum (Curculionidae), Cleonini Schönherr, 1826 nom. protectum over Geomorini Schönherr, 1823 nom. oblitum (Curculionidae), Magdalidini Pascoe, 1870 nom. protectum over Scardamyctini Gistel, 1848 nom. oblitum (Curculionidae), Agrypninae/-ini Candèze, 1857 nom. protecta over Adelocerinae/-ini Gistel, 1848 nom. oblita and Pangaurinae/-ini Gistel, 1856 nom. oblita (Elateridae), Prosternini Gistel, 1856 nom. protectum over Diacanthini Gistel, 1848 nom. oblitum (Elateridae), Calopodinae Costa, 1852 nom. protectum over Sparedrinae Gistel, 1848 nom. oblitum (Oedemeridae), Adesmiini Lacordaire, 1859 nom. protectum over Macropodini Agassiz, 1846 nom. oblitum (Tenebrionidae), Bolitophagini Kirby, 1837 nom. protectum over Eledonini Billberg, 1820 nom. oblitum (Tenebrionidae), Throscidae Laporte, 1840 nom. protectum over Stereolidae Rafinesque, 1815 nom. oblitum (Throscidae) and Lophocaterini Crowson, 1964 over Lycoptini Casey, 1890 nom. oblitum (Trogossitidae); Monotoma Herbst, 1799 nom. protectum over Monotoma Panzer, 1792 nom. oblitum (Monotomidae); Pediacus Shuckard, 1839 nom. protectum over Biophloeus Dejean, 1835 nom. oblitum (Cucujidae), Pachypus Dejean, 1821 nom. protectum over Pachypus Billberg, 1820 nom. oblitum (Scarabaeidae), Sparrmannia Laporte, 1840 nom. protectum over Leocaeta Dejean, 1833 nom. oblitum and Cephalotrichia Hope, 1837 nom. oblitum (Scarabaeidae). Zoological nomenclature affects the work of all zoologists, yet only a minuscule fraction of one percent of [the craziest] zoologists deal directly with problems associated with scientific names of animals (Bock 1994). The accurate use of scientific names in zoology is necessary to minimize nomenclatural instability and allow the maximal retrieval of scientific information from the ever increasing body of literature. Akin to other scientific names such as species- and genus-group names, family-group names are extremely important in the exchange of information about the world we live in. Rules about how to treat family-group names, as determined by the International Commission on Zoological Nomenclature [henceforth the Commission], have been an integral part of zoological nomenclature since the early 1900s (for a historical review of family-group names refer to Bock 1994). The first family-group names based on the stem of their type genus appeared in zoological literature in the early 19th Century (see Sabrosky 1999). The first authors inconsistently used a variety of endings (–ides, –ites, –ida, –i, –ide, etc.) for suprageneric divisions at various levels. The ending –idae was apparently first suggested by Kirby (1813) as a characteristic ending for names at the rank of family. Although many ranks have been used in the past for suprageneric names, only the following suffixes are currently regulated by the International Code of Zoological Nomenclature [henceforth the Code] (ICZN 1999a): superfamily (–oidea), family (–idae), subfamily (–inae), tribe (–ini) and subtribe (–ina). The last twenty five years has seen an increase in the number of studies on family-group names of entire groups in zoology (e.g., Štys and Jansson 1988 for Hemiptera: Nepomorpha; Bock 1994 for Aves; McKenna and Bell 1997 for Mammalia; Ferraris and de Pinna 1999 for Pisces: Siluriformes; Sabrosky 1999 for Diptera; Engel and Krishna 2004 for Isoptera; Speidel and Naumann 2004 for Lepidoptera: Noctuoidea; Bouchet and Rocroi 2005 for Gastropoda; Engel 2005 for Hymenoptera: Apoidea; Engel and Haas 2007 for Dermaptera; Bouchet and Rocroi 2010 for Bivalvia). The contents (i.e., whether they include fossils or not) and presentation of the data (i.e., in a classification scheme, in chronological order or in alphabetic order) in those works vary greatly. The most extensive treatments of animal family-group names to date are those of Diptera (Sabrosky 1999) and Gastropoda (Bouchet and Rocroi 2005) which covered names based on approximately 2000 and 2400 distinct type genera respectively. Some of the reasons given by authors of these works for providing comprehensive lists of family-group names include avoiding the unnecessary proposal of new names, facilitating decisions on priority and promoting long-term stability of the classification. We believe that such catalogues are especially important as the number of studies dealing with the higher relationships of major clades will continue to increase as new algorithms and data sets (e.g., molecular data) become available. Given the importance of family-group names in the scientific literature, it is rather surprising that still many authors do not cite the author or year of publication of those names correctly, or at all. According to Recommendation 51A of the Code (ICZN 1999a) “The original author and date of a name should be cited at least once in each work dealing with the taxon denoted by that name.” In addition to satisfying Recommendation 51A of the Code, citation of authorities of scientific names can also have a positive impact on modern world taxonomists (Werner 2006; Agnarson and Kuntner 2007). Adding to further confusion and errors in the literature is the fact that the Principle of Coordination (Art. 36.1) is still overlooked by some authors. Coleoptera are currently the most species-rich group of organisms on this planet with approximately 360 000 described species (Bouchard et al. 2009). The great morphological diversity of beetles has led to the proliferation of suprageneric taxa at various ranks. Latreille (1797) was apparently the first to introduce the concept of family-level taxa (see Bock 1994: 244) but it is only a few years later (Latreille 1802) that he proposed available names for these groupings, including several in the order Coleoptera. More recent evidence suggests that available family-group names in some groups of animals other than Coleoptera (e.g., Chordata: Sauropsida) appeared in the late 18th Century (see Dubois and Bour 2010), even earlier than in Latreille (1802). The nomenclature of family-group names in Coleoptera did not receive much attention until the treatment of Geadephaga names by Madge (1989). Similar lists, based on rules from two different editions of the Code (ICZN 1985g, 1999a), have now been published in Dytiscidae (Nilsson et al. 1989), Staphyliniformia (Newton and Thayer 1992), Cucujoidea (Pakaluk et al. 1994), Curculionoidea (Alonso-Zarazaga and Lyal 1999), Buprestoidea (Bellamy 2003, 2008a-d, 2009), Tenebrionidae (Bouchard et al. 2005), Scarabaeoidea (Smith 2006) and Cerambycidae (Bousquet et al. 2009). Another important contribution was that of Lawrence and Newton (1995) which included a review of the nomenclature of all beetle family-group names for the rank of subfamily and above. The vast body of scientific literature dealing with beetles has been a deterrent to producing a complete review of all Coleoptera family-group names in the past. This publication was only made possible by the collaboration of several coleopterists. The specific objectives of this study are to: 1) establish the first comprehensive list of all Coleoptera family-group names with information on type genus, author(s), year of publication and complete bibliographical references; 2) assess the availability and validity of each name using rules laid out in the most recent Code of Zoological Nomenclature (ICZN 1999a), 3) summarize Priority and Homonymy problems with currently used names and, 4) propose or implement solutions to these problems in order to promote stability. We include family-group names that were published on or before December 31, 2010. This publication should be seen as the starting point of what could eventually serve as the basis for a submission of Part of a List of Available names in Zoology (Art. 79). With this goal in mind, we ask all coleopterists to either send us, or to publish, corrections or differences of opinions in the months and years to come. It is our intention to update our list of family-group names as new data are published and to provide a second edition of this work in approximately five years. Decisions about the availability and validity of each Coleoptera family-group name in our catalogue were made following the process outline in Figure 1. First we established whether the name was available or unavailable based on the criteria of availability summarized below. If a name first proposed on a particular type genus was determined to be unavailable then searches were conducted to establish if a family-group name based on the same type genus was made available subsequently. If so then this available name was entered in our catalogue. From the pool of available names, we removed those that are permanently invalid (Art. 39). All the remaining available names were then separated into those that are valid based on the classification used here (at any rank from subtribe to superfamily) and those that are invalid (i.e., synonyms). Figure 1. Overview of the process used to determine the availability and validity of family-group names in Coleoptera (modified from Bouchet and Rocroi 2005). The number of names for each category is given in parentheses. In order to be available, a family-group name proposed before 1931 must to be a scientific name (i.e., in latinized form) in the nominative plural based on the stem of an available genus name then used as valid in the new suprageneric taxon (Art. 11.7). In addition to the criteria of availability mentioned above, new family-group names proposed between 1931 and 1999 had to be described in words, or be associated with a bibliographic reference to such a description, in order to be considered available (Arts 13, 15). In works published after 1930 which contained more than one use of a new family-group name, we selected a page where a description was clearly associated with the new taxon for the catalogue. It should be noted that replacement names proposed in that time period are available without description (Art. 13.1.3). Additionally, “a family-group name first published after 1930 and before 1961 which does not satisfy the provisions of Article 13.1 is available from its original publication only if it was used as valid before 2000, and also was not rejected by an author who, after 1960 and before 2000, expressly applied Article 13 of the then current editions of the Code” (Art. 13.2.1). Names proposed between 1931 and 1960 can also be considered available if the description of the new family-group name and a single new genus-group name is combined (Art. 13.5). Finally, family-group names proposed since 2000 have to be explicitly indicated as new and the name of the type genus has to be clearly cited in order to be available (Art. 16). Based on our interpretation of Article 16.2, any new family-group name proposed after 1999 in a paper in which the name of the type genus is clearly cited in connection with it (although maybe not explicitly with a formula such as “Type genus = Aus Doe, 2010”) is available. One of the most difficult tasks while working on this review was to decide on the most consistent and objective way to apply Article 11.7.2, which deals with the availability of names that were originally proposed in a vernacular form. Vernacular names are generally not treated as scientific names in zoological nomenclature (see Recommendation 11A). However, the International Commission on Zoological Nomenclature has made a single, but rather restricted, exception that applies to family-group names. According to the Code, a vernacular name “…is available with its original author and date only if it has been latinized by later authors and has been generally accepted as valid by authors interested in the group concerned and as dating from that first publication in vernacular form” (Art. 11.7.2). We have interpreted names proposed in the following languages to be vernacular: all German names with the suffix “–en”, all Spanish names with the suffix “–os” or “–as” and all French names with the suffix “–iens”. The most important issue was to determine the correct status of names originally proposed with the suffix “–es.” We have used the principle that all family-group names proposed by non-French writers with the suffix “–es” were in fact latinized names with an ending that differs from those regulated by the Commission (these are mostly older names proposed before rules of zoological nomenclature became well-established). For each name with the suffix “–es” first proposed by French workers (e.g., Latreille, Lacordaire, Lameere) we went through the entire work containing those names and established if these authors consistently used either vernacular or latinized names in their work. French vernacular names often have accents in them (“é” or “è”) while latinized names do not. We have found that determining whether an author used vernacular or latinized names in a particular work was fairly straightforward (Bousquet et al. 2009). Latreille proposed new family-group names with the suffix “–es” in several of his works. We noticed that he most often used both the vernacular (listed first, with accents when required by French language) and latinized (listed second, always in italics) forms of each name together in the same heading. We have listed the latinized form of the name in each of those cases. As in Bousquet et al. (2009), we have interpreted the requirements listed in Art. 11.7.2. as three separate conditions to be met. For each vernacular name we determined if it had 1) been subsequently latinized, 2) been generally accepted as valid by authors interested in the group and 3) been attributed to the author and date of original publication. Failure to fulfil any of the requirements resulted in the treatment of that name as unavailable. In those cases, we provide a comment explaining why this taxon was treated as unavailable (e.g., “original vernacular name unavailable (Art. 11.7.2): not subsequently latinized”). Many recent authors have treated family-group names first proposed in vernacular form as available if they were latinized by later authors but we do not believe that this practice is in line with the requirements of the Code. We have accepted as available all vernacular names published before 1900 that have subsequently been used in latinized form, while being used as valid, and credited to the publication in their vernacular form. For every vernacular name that meets the requirement of availability, we have added a comment in the format of the following example “original vernacular name available (Art. 11.7.2): first used in latinized form by J. L. LeConte (1862: 240, as Meracanthini), generally accepted as in Gebien (1911: 567, as Meracanthinae)”. Article 29.2 includes a list of suffixes to be used for groups at the superfamily (-oidea), family (-idae), subfamily (-inae), tribe (-ini) and subtribe (-ina) names. The suffix of other categories is not regulated by the Code. The rank of supertribe (-itae) was used here for a small number of groups in which recent changes in classification required an additional rank between subfamily and tribe (e.g., Staphylinoidea). The correct spelling of family-group names depends on the stem of its type genus (Art. 29.3). As pointed out by Newton and Thayer (1992) the family-group name stems of most generic names that can be regarded as Latin nouns are determined easily by dropping the following nominative case ending –us, –um, –es and –a. Examples of such straightforward case in Coleoptera include Carabidae (type genus Carabus), Adeliini (type genus Adelium), Trechodina (type genus Trechodes) and Anthiini (type genus Anthia). A summary of other commonly encountered generic endings, along with their corresponding stems, is given in Table 1. Note that generic names ending with -gaster (Greek for stomach) can have either -gaster- or -gastr- as their correct stem and therefore we have accepted the stem formation of the first author of the family-group name based on such genera as correct. Stems were reviewed for all type genera included in our catalogue. Table 1. List of common Coleoptera generic suffixes with their associated family-group name endings (based partly on Bouchet and Rocroi 2005, with additions by YB, AFN, MAAZ and M. K. Thayer). It should be noted that if a family-group name was not formed in accordance with Art. 29.3 but its original spelling is in prevailing usage then the current spelling is to be maintained (Art. 29.5). We have conserved the spelling of several family-group names currently used as valid however we did not do so for names that are listed as synonyms. For names based on incorrect stems proposed after 1999, we have considered that prevailing usage cannot be used to conserve the original spellings because too few references using these names could be found. We have therefore corrected the stems of such names unless the name of the type genus was an arbitrary combination of letters (Art. 29.4). As stated in Art. 35.4.1 “A family-group name based upon an unjustified emendation … or an incorrect spelling of the name of the type genus must be corrected, unless it is preserved under Article 29.5 or unless the spelling of the genus-group name used to form the family-group name is preserved under Articles 33.2.3.1 or 33.3.1.” When an unjustified emendation or an incorrect subsequent spelling of the type genus is in prevailing usage and is attributed to the original author and date (Art. 33.2.3.1; 33.3.1), the correct spelling of the type genus is that in current usage. In the glossary of the Code, a name in prevailing usage is defined as a “name which is adopted by at least a substantial majority of the most recent authors concerned with the relevant taxon, irrespective of how long ago their work was published”. The unfortunate subjectivity in this definition, as pointed out by Ferraris (2000), left us with no choice but determine prevailing usage in an ad hoc fashion throughout. As for species- and genus-group names, the oldest available name for a family-group taxon should be considered as valid (Art. 23). However four important exceptions need further discussion. Firstly, when a little-known family-group name was discovered to be older than a name currently used as valid for a particular taxon, we used the Reversal of Precedence to conserve usage of the younger name if the conditions of Art. 23.9.2 could be fulfilled. Younger names conserved using Reversal of Precedence are listed in Appendix 1. In some instances we could not fulfill all conditions of Art. 23.9.2 although we considered that using the newly discovered older name as valid would threaten stability or cause confusion. In those cases we maintained usage of the younger name as valid and either submitted an application to the Commission to conserve the younger name or made a recommendation that such submission should be submitted in the near future (Art. 23.9.3). According to Art. 35.5 “If after 1999 a name in use for a family-group taxon (e.g., for a subfamily) is found to be older than a name in prevailing usage for a taxon at higher rank in the same family-group taxon (e.g., for the family within which the older name is the name of a subfamily) the older name is not to displace the younger name.” Indeed, we encountered a small number of cases in which the replacement of a name at the higher rank (e.g., Lymexyloidea Fleming, 1821) by the discovery of an older name for a taxon at a lower rank (e.g., Hylecoetoidea Germar, 1818) would not have served the stability of well-established names. In such cases usage of the younger name at the higher rank was conserved. In cases where a family-group name was replaced before 1961 because of the synonymy of its type genus (e.g., Lepiceridae Hinton, 1936 instead of Cyathoceridae Sharp, 1882), the substitute name is to be maintained if it is in prevailing usage (Art. 40.2). In such cases, the valid family-group name retains its own author but takes the priority of the replaced name. Based on Recommendation 40A, we have cited those names with their original author and date, followed by the date of its priority enclosed in parentheses, as determined by Art. 40.2.1 (e.g., Lepiceridae Hinton, 1936 (1882)). Lastly, if the stability and continuity of the meaning of a family-group name is threatened by the discovery that the type genus was originally misidentified, or that the type genus was based on a misidentified type species, or that an older type species of the type genus had been overlooked, then the case is to be referred to the Commission for a ruling (Art. 65.2.1). In cases where the oldest available name for a family-group taxon is based on misidentified type genus, or an altered concept of the type genus (e.g., see Scydmaenini Reitter, 1882), we have preferred to consider this name as invalid and to use instead the family-group name which is in prevailing usage (e.g., Cyrtoscydmini L. W. Schaufuss, 1889) until an application is submitted and a ruling is rendered by the Commission. A list of problem cases based on the Principle of Priority, with comments on implementation of solutions or necessary actions to be taken in the future, is given in Appendix 2. Based on the Principle of Homonymy “when two or more names are homonyms, only the senior, as determined by the Principle of Priority…, may be used as the valid name…” (Art. 55.2). Here we report several instances in which family-group names in Coleoptera are identical to other family-group names in zoological nomenclature. These names are either based on identical type genera or on type genera that are similar but not identical. In the first instance the family-group name based on the preoccupied type genus is permanently invalid (Art. 39) but available. When family-group names are homonyms because their type genera are similar but not identical, the case must be referred to the Commission for a ruling to remove homonymy (Art. 55.3.1). Such is the case with Adeliini Kirby, 1825 (type genus Adelium Kirby, 1819) and the hymenopteran name Adeliini Viereck, 1918 (type genus Adelius Haliday, 1833) which are both correctly formed from the stem of their type genus. More than thirty such cases were encountered during our research on Coleoptera family-group names. Junior homonyms conserved using Reversal of Precedence are listed in Appendix 1. A list of problem cases based on the Principle of Homonymy, with comments on implementation of solutions or necessary actions to be taken in the future, is given in Appendix 3. As mentioned above, we have encountered several cases which require an application to the Commission because of problems with priority and/or homonymy. Some of these cases have been submitted recently (Engel and Bouchard 2009, Bousquet et al. 2010, Bousquet and Bouchard 2010) and others will be submitted in the near future (see summary in Appendices 2 and 3). However, it is not our intention to submit applications for all cases. Since we intend to submit this work as Part of the List of Available Names in Zoology in approximately five years, we hope the coleopterist community will take this opportunity to submit applications to the Commission in order to resolve some of the remaining problems outlined here. Von Hayek (1973: 282, 290) and Stibick (1979: 157) reported that the important works on Elateridae classification by Candèze (1857) and Lacordaire (1857) were published in May and June of 1857 respectively. Since then, when the same new name appeared in both of these works, Candèze’s names have been given priority over Lacordaire’s. We have discovered that Lacordaire’s work was in fact published before 25 May 1857 (as recorded by the Académie des Sciences de France) which would make the names in his work the oldest based on strict adherence to the Code (Art. 21.3). In order to avoid unnecessary changes in authorship in the future and maintain prevailing usage, we have opted to continue attributing elaterid family-group names to Candèze, 1857. Authorship of the three volumes on Coleoptera of the series Encyclopédie d’histoire naturelle is debated. The title pages on the volumes list Jean Charles Chenu as the author of the Encyclopédie d’histoire naturelle with the assistance of Eugène Desmarest for the Coleoptera section. However, the Société Entomologique de France recorded the livraisons received for 1851 in their Bulletin (p. cxxv) as “Encyclopédie d’histoire naturelle, ou traité complet de cette science, sous la direction de M. le docteur Chenu. Coléoptères, par M.E. Desmarest.” This was likely the title on the wrapper and clearly suggests that Desmarest was responsible alone for the three volume series on Coleoptera. This is also substained by Desmarest himself who in the Bulletin de la Société Entomologique de France for 1860 (p. lxiii) speaks of the three volumes series as being his work, published under the direction of Chenu. Based on the above fact, we credit the three-volume series to Desmarest alone (Desmarest 1851, 1857, 1860). However, the first fascicles of the Histoire Naturelle series up to the “Pectinipèdes” were not reprinted in journals. It seems that most of the succeeding fascicles were submitted to the various Sociétés, were printed by Dumoulin, Barret, Pinier, etc. at Lyon, the dedications were then added and they were sent to Paris for separate publication with the same typesetting, and with changes only to the pagination and some titles. Since the issuing of the journal volumes was frequently delayed by the compilation of many papers (usually in the following year), the separate edition often appeared first, as shown by records of other journals and, in particular, the Bibliographie de la France. Therefore we have given date priority to the Histoire Naturelle versions in most instances, only those page numbers are cited with the scientific names in the catalogue unless evidence was found to the contrary, and the alternate versions are cited only in the bibliography, following each reference. This paper is organized into two main parts: 1) a synoptic classification containing only the names which we consider as valid herein and 2) a catalogue of all family-group names organized in the same order as in the synoptic classification. It should be noted that our publication is first and foremost a nomenclatural treatment of family-group names. We want to emphasize that the classification used here is not based on newly generated phylogenetic data. Furthermore, we do not necessarily endorse all parts of the classification presented, particularly those which were not based on phylogenetic approaches. For the most part, we follow currently accepted concepts in recent taxon-specific catalogues as well as comprehensive syntheses such as the Handbook of Zoology (Beutel and Leschen 2005, Leschen et al. 2010), American Beetles (Arnett and Thomas 2000; Arnett et al. 2002) and the Catalogue of Palaearctic Coleoptera (Löbl and Smetana 2003, 2004, 2006, 2007, 2008, 2010). Although we recognize that the classification we use will likely become outdated in the near future, we believe that this is the best way to present the assembled data. Only family-group names that are based on genera are included in our catalogue. For each family-group name the original spelling, author, year of publication, page number, correct stem and type genus are given. Complete data and comments regarding a particular family-group name are presented with the lowest-rank name when the same stem is used in more than one rank, since the same criteria apply in accordance with the Principle of Coordination (Art. 36.1). The correct stem to be used, which is given in square brackets (e.g., [stem: Uralocole-]), is especially important for synonyms, since the status of a name may be changed from synonym to valid in the future. Subsequent alternative spellings of family-group names (i.e., simple changes in suffix depending on change in rank) are not given here. Both available and unavailable names are listed together in the catalogue in order to enhance information retrieval. Unavailable names are preceded by an asterisk “*” and are identified as such in the “Comments” section along with the reason for this status. As is common practice in publications of the International Commission on Zoological Nomenclature, we use small capital letters for family-group names. Names in the catalogue are organized in a “phylogenetic” framework, as accepted in recent publications on the group, down to subfamily level. Valid tribes and subtribes are listed in alphabetical order within each subfamily. Synonyms are listed in chronological order under each valid taxon. Because of the importance of the Principle of Priority, we have tried to find the most accurate date of publication (given in square brackets in the References section) for works cited in the manuscript. The date of publication was determined either from the original publication itself, from the date of “stamps” when received in libraries of natural history institutions or from secondary literature sources. A list of natural history institutions and secondary literature sources is given at the beginning of the References section. Data on dates of publication were provided by AFN, PB, AED, MAAZ, CHCL, ABTS and YB. References for type genera are not included here to conserve space and because they are for the most part available in other recent publications (e.g., Löbl and Smetana 2003, 2004, 2006, 2007, 2008, 2010). Names on the Official List of Family-Group Names in Zoology and type genera on the Official List of Generic Names in Zoology are included in our catalogue and are summarized in Appendix 4 and 5 respectively. Cases involving family-group names and/or their type genera that are awaiting a ruling by the Commission are summarized in Appendix 6. A total of 4887 family-group names are included in our catalogue (see Figure 1). Of the names recorded, 4492 are available, of which 183 are permanently invalid because they are based on a preoccupied type genus or a genus which has been suppressed by the Commission. The majority of names were proposed in the suborder Polyphaga (4314) followed by Adephaga (531), Myxophaga (16), Archostemata (17) and Protocoleoptera (9). Within Adephaga the family Carabidae contains the highest number of names by far (441) followed by Dytiscidae (47). The five superfamilies with the highest number of names in Polyphaga are the Curculionoidea (862), Chrysomeloidea (794), Staphylinoidea (594), Tenebrionoidea (579) and Scarabaeoidea (436). Overall, the five families with the highest number of family-group names proposed are Curculionidae (555), Staphylinidae (493), Cerambycidae (468), Carabidae (441) and Tenebrionidae (323). 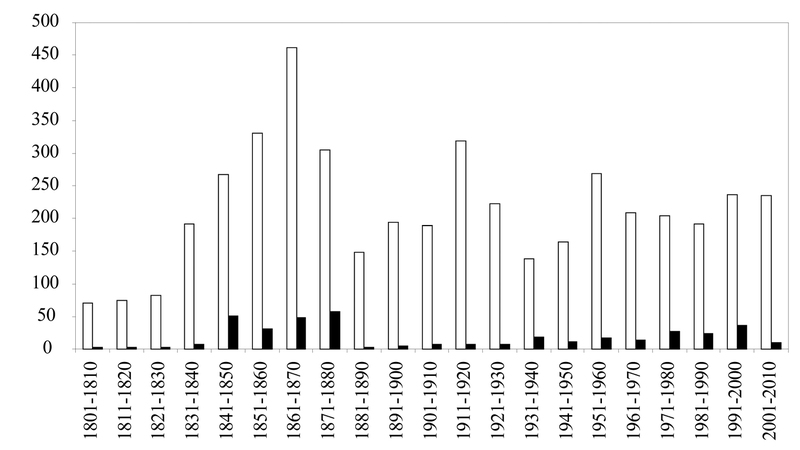 The number of Coleoptera family-group names that appeared in the 19th and 20th Centuries are almost identical (2331 and 2556 respectively) while the last decade saw an increase of 5% (246 names) in the total number of names in the literature (Figure 2). A large number of names proposed in the middle of the 19th Century are unavailable. Those names were generally proposed in vernacular form and were not made available subsequently (Art. 11.7.2). Unavailable names proposed after 1930 generally lacked a description or bibliographic reference to such a description (Arts 13, 15). Several names proposed in the last decade were either not explicitly introduced as new taxa or did not include necessary information about the type genus and are therefore unavailable (Art. 16). Figure 2. Number of family-group names proposed in Coleoptera by decade. White bars = available names. Black bars = unavailable names. A summary of the most significant contributions, in terms of the total number of names proposed by author, is shown in Table 2. Eighteen authors proposed 50 or more family-group names in Coleoptera. Lacordaire was the most prolific with 353 new names. Although the majority of Lacordaire’s names were proposed in vernacular form, a large proportion of them (90%) were subsequently made available and many are used as valid today. Table 2. Summary of number of family-group names in Coleoptera by author. Only authors that have proposed fifty or more names are included. Authors listed in decreasing order by total number of names proposed. For each author we give the total number of name proposed, the percentage of those names that are available, the range of years in which those names were proposed and the number of families in which they proposed new family-group names in. The authors with the lowest percentage of available family-group names (Mulsant, Chapuis, Rey and Blanchard) originally proposed their names in vernacular form and a significant proportion of those names were not made available subsequently. All names proposed by LeConte, Reitter, Casey, Horn, Legalov, C. G. Thomson and Laporte are considered available. Thirteen of the authors in Table 2 were active exclusively during the 19th Century while two authors, Reitter and Casey, published their works containing new family-group names in both the 19th and 20th Centuries. Two authors published family-group names exclusively during the 20th Century (Jeannel and Voss). Legalov is our only contemporary colleague in this list; he proposed more than 50 new family-group names in the last decade. It should be noted that the recent proliferation of new scientific names proposed by Legalov is treated by some authors as “extreme splitting” (Riedel 2006) and “based on numerous spurious characters of doubtful phylogenetic value” (Oberprieler et al. 2007). The broad taxonomic interests and expertise of Lacordaire, Gistel, LeConte, Mulsant, Latreille and C. G. Thomson are exemplified by the fact that they introduced new family-group names in 25 or more families. This was done either in catalogues (e.g., Gistel, C. G. Thomson) and/or in large scale taxonomic treatments (e.g., Lacordaire, LeConte, Latreille, Mulsant). On the other hand, the taxonomic expertise of J. Thomson, Chapuis, Jeannel, Voss, Burmeister and Legalov is much more targeted towards a small number of families (fewer than 10). The following synonymies are recorded here for the first time: Agronomina Gistel, 1848 syn. nov. of Amarina Zimmermann, 1832 (Carabidae), Hylepnigalioini Gistel, 1856 syn. nov. of Melandryini Leach, 1815 (Melandryidae), Polycystophoridae Gistel, 1856 syn. nov. of Malachiinae Fleming, 1821 (Melyridae), Sclerasteinae Gistel, 1856 syn. nov. of Ptilininae Shuckard, 1839 (Ptinidae), Phloeonomini Ádám, 2001 syn. nov. of Omaliini MacLeay, 1825 (Staphylinidae), Sepedophilini Ádám, 2001 syn. nov. of Tachyporini MacLeay, 1825 (Staphylinidae), Phibalini Gistel, 1856 syn. nov. of Cteniopodini Solier, 1835 (Tenebrionidae); Agronoma Gistel 1848 (type species Carabus familiaris Duftschmid, 1812, designated herein) syn. nov. of Amara Bonelli, 1810 (Carabidae), Hylepnigalio Gistel, 1856 (type species Chrysomela caraboides Linnaeus, 1760, by monotypy) syn. nov. of Melandrya Fabricius, 1801 (Melandryidae), Polycystophorus Gistel, 1856 (type species Cantharis aeneus Linnaeus, 1758, designated herein) syn. nov. of Malachius Fabricius, 1775 (Melyridae), Sclerastes Gistel, 1856 (type species Ptilinus costatus Gyllenhal, 1827, designated herein) syn. nov. of Ptilinus Geoffroy, 1762 (Ptinidae), Paniscus Gistel, 1848 (type species Scarabaeus fasciatus Linnaeus, 1758, designated herein) syn. nov. of Trichius Fabricius, 1775 (Scarabaeidae), Phibalus Gistel, 1856 (type species Chrysomela pubescens Linnaeus, 1758, by monotypy) syn. nov. of Omophlus Dejean, 1834 (Tenebrionidae). The following replacement name is used here for the first time: Gompeliina Bouchard, 2011 nom. nov. for Olotelina Báguena Corella, 1948 (Aderidae).